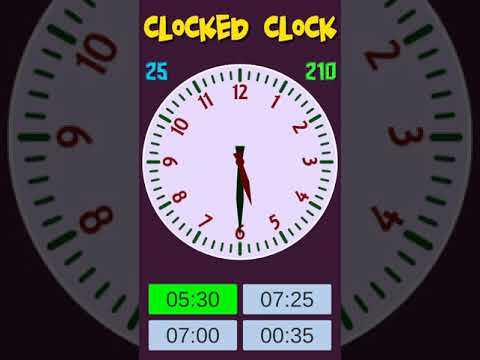 Your child is going to learn reading and using analog clock with fun. Choose the difficulty level accoding to your child's knowledge. For example if your child only knows the numbers, start the "Very Easy" level. The child will just match the numbers with the actions of the hour-hand. We collect the minimum amount of information about you that is commensurate with providing you with a satisfactory service. This Policy indicates the type of processes that may result in data being collected about you. Your use of the Clocked Clock or website gives us the right to collect that information. Upon registration, you are required to provide a valid Account E-mail address. Your Account E-mail is never shown publicly under any circumstance. You are also required to provide a unique Nickname that will be publicly visible when we find it appropriate and/or permitted by you. It is your responsibility to chose a nickname that is different from your real name. We claim no responsibility for any damage done as a result to your name being exposed publicly. Your other information that may have been willingly provided such as real name, phone numbers, personal e-mails, addresses, etc... are kept confidential unless stated otherwise at the time of entering them.